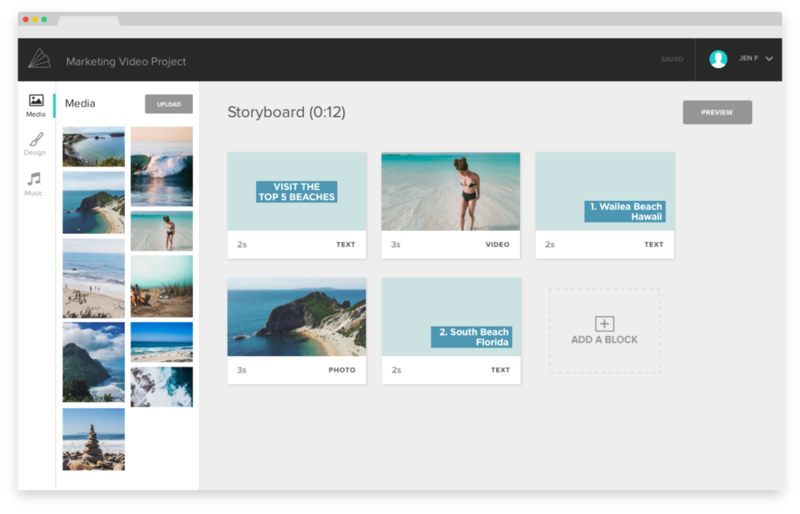 Animoto's Marketing Video Builder allows users to easily turn their photos and video clips into share-worthy social videos. My team and I were tasked with solving these problems and getting the product ready for launch. Our goal was to uncover the user's critical path; defining the steps a user had to take in order to produce a video they're happy with. Our hypothesis was that if we gave users the ability to complete a majority of that critical path from the storyboard view, completion rates would increase. As you can imagine, this phase required copious amounts of post-it notes. Through a series of exercises (including creating personas, gathering usage statistics, observing testing sessions, creating empathy maps, etc.) we were able to define the critical path. In short, we want to enable users to quickly add their media, build out their story, customize the look and feel, and produce their video. We set out to redesign the storyboard interface to facilitate, not obscure the path to video production. By simplifying content blocks into cards and giving users an expandable drawer for common editing tools from the storyboard view, we helped users create videos faster. This made the edit view, a screen state where users were getting lost and abandoning their project, an optional step in the process. 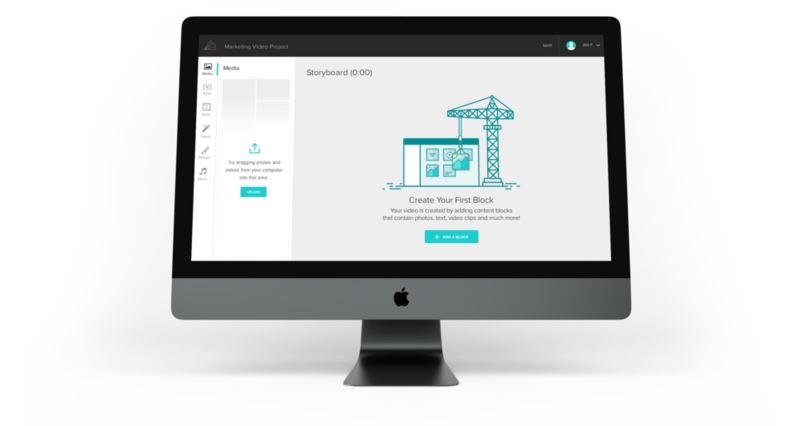 Previously, blocks had limited functionality and forced the user into a new screen state to make crucial edits. After the redesign, users can quickly and easily upload media, or add/remove content from their blocks. The redesign showed a 41% increase in the number of users uploading media to their projects as well as a 63% increase in the number of users previewing their videos. But wait, what's a block? The power of the Marketing Video Builder is that it moves away from the traditional timeline experience by enabling users to create videos by adding content blocks. While it was a great model, the concept of building a video out of blocks was completely unfamiliar to users. Adding a descriptive zero state with a fun illustration not only helped reinforce the concept that videos were built by creating content blocks, but also gave users a clear place to start. Moving the "Add a Block" button to the top of the screen ensures it's always available to users and never hidden. User testing showed that upon seeing the new zero state, 4 out of 5 users were able to articulate what a block was and that the add a block experience met their expectations.